"I love it! Hands-on and easy to use, with clear explanations in language you and your kids will easily understand. After perusing several dull chemistry books and a computer program that almost crashed my computer, I was genuinely relieved to find this course. 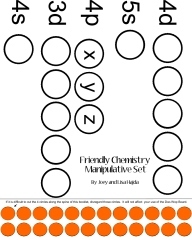 Friendly Chemistry is designed to provide all that's needed for high school studies and college entrance, and you'll have fun learning it all. Included are brief biographies of important scientists and many games, some with multiple playing levels to challenge you as you learn." Jean Reed, The Home School Resource Book, 3rd edition. My daughter said that Friendly Chemistry explained things more in-depth and more clearly than the curriculum we tried previously. Focusing on the concepts and less on the formulas was just what she needed. We are glad you wrote this curriculum and will recommend it to others." Parent of high schooler.